264 is one of 15 double deck balcony cars delivered in 1907 to Sheffield Corporation Tramways by the United Electric Car Company of Preston. The body has wooden seats for 54 passengers, and is mounted on a 4-wheel Peckham P22 truck with two Metrovick 102DR 60hp motors operated by BTH B510 controllers. The braking systems comprise a handbrake acting on all wheels, an electric brake for emergency use and a hand-wheel operated track brake. The tram was rebuilt in 1926 with a totally-enclosed upper deck. Then, owing to the large number of new more modern trams introduced by Sheffield, it was renumbered 342 in the late 1930s and relegated to peak-hour use, although it survived in service until 1956. 342 was acquired by the British Transport Commission and exhibited in Clapham Transport Museum until 1967, when its removal to Consett Iron Company premises was organised by the Northern Tramway Sponsors. 342 arrived at Beamish in December 1973 painted in Gateshead colours and temporarily converted to an open top layout owing to the poor condition of the upper deck structure. 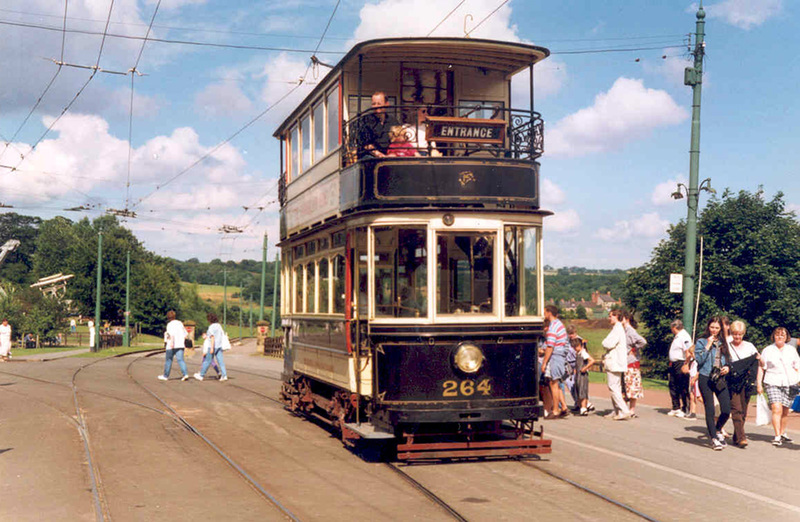 The tram operated in this form until 1985, when it was withdrawn for a major rebuild to restore it to its 1920s condition as open balcony car 264. This work, which involved the construction of a substantially new top deck incorporating many original components, and the application of the ornate period Sheffield livery of Prussian blue and cream with gold lining, was completed in 1987. In this form 264 proved to be a most useful all-weather tram, and has worked hard for a further 14 years. However, the decision had to be taken to withdraw 264 from service in 2002, pending major restoration work which began in 2014 and is due to be completed in 2015 with the tram re-entering full service in time for the 2016 season commencement. Most of the work has been undertaken in-house and can be followed on the news pages of this site.